Plan to exhibit in 2019! Exhibiting at the International Trauma Conference brings you face-to-face with key decision makers who purchase emergency medical products and services for EMS systems, hospitals and training institutions around the world. Target a diverse audience of industry professionals with ITLS. 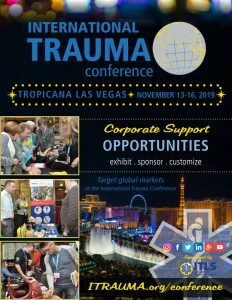 ITLS is looking for ways to expand your presence and increase your profile at the International Trauma Conference and beyond. Our Corporate Opportunities Prospectus lists options at a variety of price points for maximum exposure. Registration is open now and the Exhibit Hall is already filling! Contact ITLS Exhibit Manager Sue McDonough at suem@itrauma.org or 630-495-6442, ext. 201. It is the support of these vendors that makes the International Trauma Conference possible.